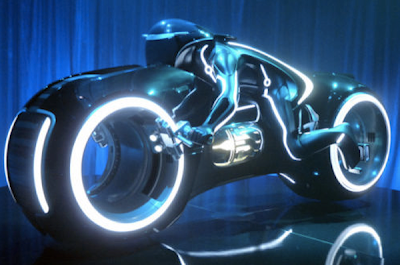 The Parker Brothers Choppers in Florida are selling off three working Lightcycle replicas like the ones in the upcoming movie TRON Legacy. If you’ve been dreaming of having your own Lightcycle ever since the first TRON and have the cash for it, better act quickly since there are only three of these babies left. Each bike will set you back around €27,900 ($35,000) and each unit is custom-built and unique. Even the color is one-of-a-kind since they won’t make a bike the same color as ones already sold. To top it off, these are real, working motorcycles and not just something to sit on and pose for a photo-op. I doubt buyers will be using these for their daily grocery run but the maker says they are built for street use. Each bike features hubless wheels, neon accents, a fiberglass body and either an electric or gas motor. Each bike will come with either a high powered electric motor or a high performance gasoline motor and transmission depending on the buyers needs. Be the envy of everyone who sees this bike as it will make motorcycles as you now know them seem like antiques on the road.